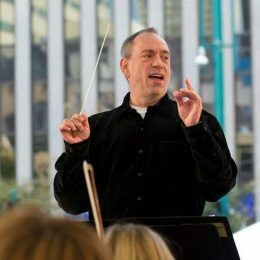 The local, regional and national arts community is mourning the loss of Scot Woolley, a gifted musical director, arranger, composer, superb pianist, and impactful music professor and vocal coach who died Saturday, Jan. 26, having suffered a medical emergency while driving in Cincinnati. The personable 60-year-old, who will be dearly missed, was primarily known across the Miami Valley for his associations with the Human Race Theatre Company and Wright State University. In fact, just two months ago, he helped create the Human Race’s “Americana Christmas,” among the numerous shows featuring his music direction as a Human Race Resident Artist. Personally, his fantastic music direction and accompaniment of the Human Race’s jazz-driven “Play It Cool” developmental workshop will always be a favorite of mine. At WSU, Woolley was serving in his seventh year as music director. In addition to last fall’s “Crazy for You,” he also conducted “Grand Hotel,” “Hot Mikado,” “Les Misérables,” “No, No, Nanette,” and “Fiddler on the Roof” among many others. He was also a great asset to the musicality of the annual NYC Senior Showcase. Read the article by Russell Florence Jr. on Dayton.com.